Validation rules allow you to specify certain conditions that must be met in order for your form to be submitted. For example, you can set some fields to "required" meaning that they need a value in them before the form will be saved. You can also check for certain conditions to be met, such as ensuring that a field's input is alphanumeric, or of a proper email format. In your Site form or Admin form view, click the "3" button. On the field you want to apply the validation rule to, click the "optional" text. In the popup that appears, you will see the options that you have for setting your validation rules. 1. Here you can set whether you want the field to require input or not. "No" means that the form can be submitted without a value in that field. "Yes" means that the field must be filled before the form can be submitted. 3. Here you can set the type of check on the value placed in the field that must be met before the form can be submitted. 4. 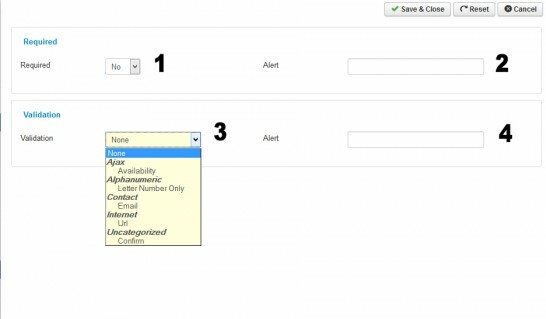 Here you can specify another Alert message that appears in addition to the message in 2. if your validation conditions are not met.